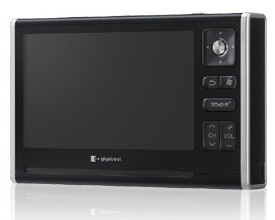 The latest Toshiba multimedia player, Gigabeat V801, has been unveiled by the Japanese electronic giant lately. This little, unique and elegant gadget is featured with an 80-gigabyte hard disk which allows users to store 339 hours of video images or 20,000 music pieces and digital broadcasting for mobile gadgets. Toshiba Gigabeat V801 comes with a 4-inch, 24-bit colour, 480 x 272 pixel screen and a durable battery which can last for 28 hours of playback audio and 10 hours of playback video. It has a built-in brightness sensor for automatic adjustment to local lighting conditions. V801 weighs over half-a-pound and it supports MP3, WMA and WMV files. It also plays portable SEGA games. This latest player costs around ¥59,800 / $491.